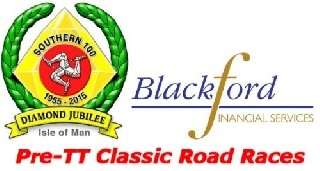 Southern 100 Racing, organisers of the Blackford Financial Services Pre - TT Classic Road Races are pleased to confirm that having received Royal Assent this years event will be run on Friday, Saturday and Sunday 29th, 30th and 31st May 2015. This is a change from the usual Friday, Saturday and Monday, as Monday 1st June 2015 is not a Bank Holiday this year. With 10 days remaining until entries close the organisers have so far received 184 entries for the seven races.